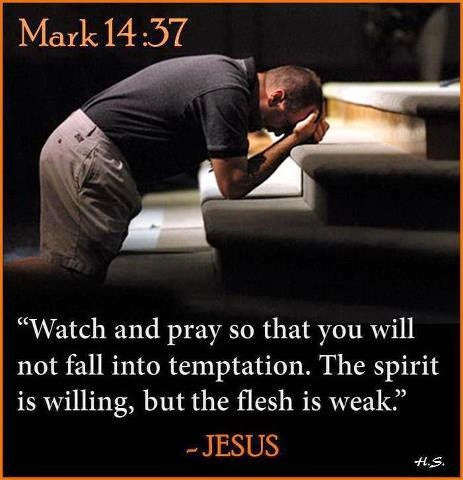 Watch and pray because the devil is always prowling around seeking whom to devour. So watch, and keep yourself guarded the enemy is only seeking for an opportune time. No excuses this year, give your time to God. satan does not deserve your time. satan is looking for that opportune time where you just open the door every so slightly to sin. Remember Jesus is your firm foundation, know that through Him you are more than able to stand secure. And it’s not by your might and neither is it by your power but by His Spirit. You’ve got to put that flesh under total subjection. There are Godly opportunities, and there are satanic opportunities. If you are not mature in the Spirit you will choose the latter. A little sin here and there is enough to unintentionally invite satan to your door. But Jesus fasted for forty days and nights in the wilderness, yet the enemy still paid Jesus a visit to try to tempt Him. So you see, the enemy will try to defeat you at all costs as long as you stand for Jesus Christ. So do not be surprised when you finish your fast, and the enemy becomes even realer to you. It’s nothing new, he tried it with Jesus. At the point where Jesus was abstaining from food, THAT is exactly what the enemy tried to tempt Jesus with. Brethren, it does not matter that satan may know your weakness, what matters is that you know the POWER you have. Yes there is power inside of you, you have Jesus! Which means you are more than able to overcome. 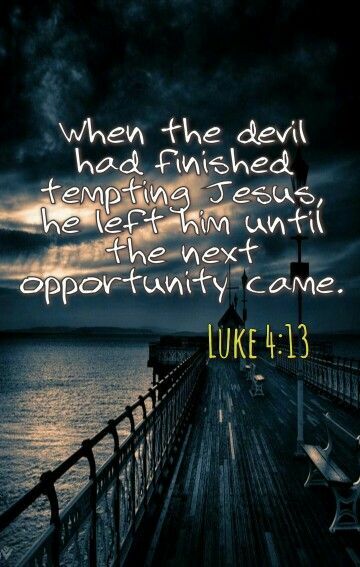 Well Luke 4 tells me that the enemy tried to tempt Jesus three good times and on all occasions, he failed miserably. And the opportune time that satan sought for, he never found. For God’s divine opportune time prevailed. He has already won the victory, and we have that same victory. The enemy will try to come at your lowest and even your highest points, that is why you must PRAY. Fasting and prayer is essential for every believer that desires to make it in this life. Jesus was in isolation for 40 days and nights, we have to deny our flesh if we desire to see more of and hear more of God. Remember flesh and blood cannot enter into the kingdom of God, so quit trying to drag all your fleshy baggage along with you. Brethren, it is time to let go and let God. satan is not playing games, he is seriously seeking an opportune time to destroy the children of God. We must be diligent in Spirit. Forty days and nights in the wilderness, forty days and nights! Who can make such a sacrifice in this day and age? That is what I call the supernatural strength of God. Jesus was away from everyone and everything, but God. A time must come in our lives whereby we just trust God in the wilderness. When we trust God in the wilderness, He prepares and strengthens us to become destined overcomers. Trust God, listen, be diligent, be discerning, be strengthened, be prayerful, and you shall most certainly be victorious. Amen. Outsmart, outdo, outwit, and overtake the opportune time of the enemy through prayer!! !